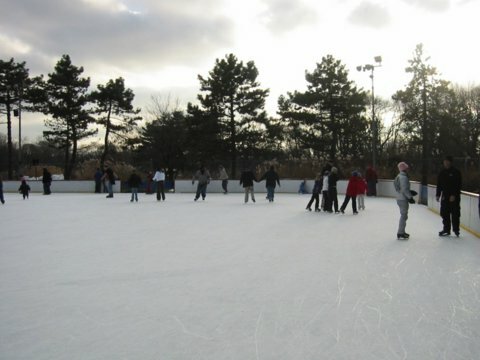 The big new skating center in Prospect Park, a $25 million facility that would replace the Wollman Rink, could be open by 2010. The Lakeside Center--so called until it is renamed--would include two rinks, one for hockey and one for recreational use. It would rise on the site of a parking lot next to the existing Wollman Rink. The site of the current rink will be restored to its original landscaping at an additional cost of $10 million, bringing the total price tag to $35 million. The current rink, which is more than 40 years old, has has long been a thorn in the side of Prospect Park purists. Created during the reign of Robert Moses, the rink replaced what had been Music Island, a small island with a stage facing the audiences in the park's Concert Grove. Its construction altered what is said to have been one of the park's most beautiful vistas. The ice rink plans were presented by Prospect Park Alliance President Tupper Thomas at a meeting of the Park Slope Civic Council. The name of the project architect--who is said to be internationally known and based in New York City, but with only one New York project to his name--will be announced on February 20. The project itself must be reviewed by both the Landmarks and Arts commissions. "There will be many opportunities for people to have something to say and something to say against it," Ms. Thomas said. Public meetings will be held to present and discuss the plans. Money has been raised to cover the $25 million cost of the ice center, but the Alliance still has to raise another $ 10 million for the restoration of Music Island and the Concert Grove. Ms. Thomas said the Alliance would "be happy with a naming opportunity," but joked that it would avoid "specific banks" and "developers," a reference to the Barclays Arena naming controversy and, presumably to developer Bruce Ratner. While the news rinks would be open air, there would be a two level building included in the project. The building would include classroom space, a cafe and other amenities. The hockey rink would have a roof or covering of some kind. Both rinks would be intended for year-round use, although for purposes other than skating during warm months. The covered space would be rented out for picnics and outings and the other would be used as a play area. The existing Wollman Rink would remain open for part of the construction process, but would have to be closed at some point before the new facility is complete. "Gridlock" Sam Schwartz will analyze traffic impacts of the new facility, and there would be disruptions in the area around the rink during the construction period. A google search shows that the architects for this project are Tod Williams Billie Tsien and Associates. Does this mean that there will be no parking lot? That would be awesome, as cars are anti-urban. If that's not it, then I hope they at least give the rink a separate driveway with an underpass under the loop road so that recreational users don't have to deal with the danger of cars. Red Hook Piers Plan Taking On Water?